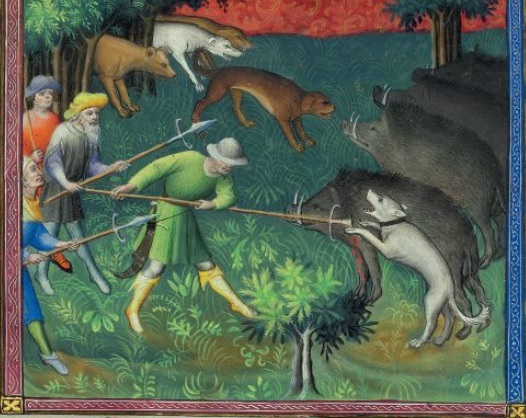 Hunting wolf in 14th century was mostly considered something you had to do. Pestcontrol. The wolf was not considered a noble animal, and its by-name (Noanamn) in swedish was ‘varg’ who’s original meaning was thief, or a generally bad person (a ‘Kasevarg’ was an arsonist). By-names was used for creatures that was feared, as using its real name supposedly would make it take notice and come to your farm and you wanted to avoid that. Hence, it is called ‘varg’ (thief) instead of its real name, Ulv. These days it is generally known as varg (better not take any chances still, eh?). ‘Being hanged with wolves’ was a shameful way to be executed where you were hanged on the same gibbet as wolfs. Edwards has some things to say about the wolf in his Master of game. of flesh and on all carrion and all kinds of vermin. other vermin that they eat. So, hunting wolf is not considered a noble hunt, but more a hunt out of necessity. Therefor there was no rules to the hunt, they could be hunted with nets, traps, poison, dogs, spikes in meat, or, if you liked, par force. According to the Book of St. Albans, the wolf was hunted from the Nativity of the Virgin Mary (September 8) to the Annunciation (March 25), making this a winterhunt. On the other hand. 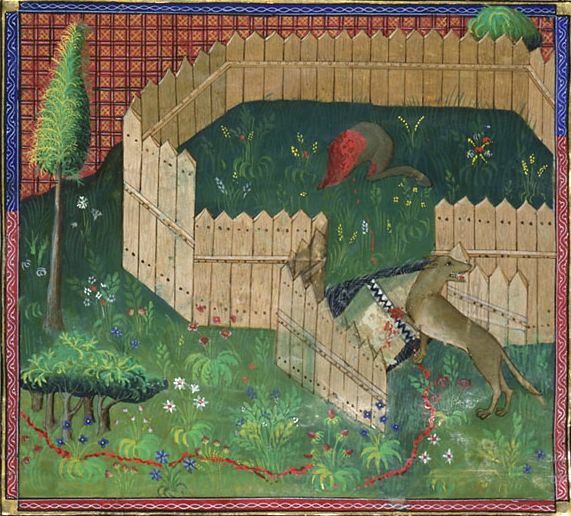 In his treaty of hunting from 1330, Twiti states the wolf as one of the few animals that you blow the Meneé for, and both the male and the female wolf to boot! This duality in looking at the wolf is probably because it is a difficult animal to hunt par force, i deserves rescpet for being hard to hubnt, even if it is considered pestcontrol. The meneé is of course only blown when the wolf is hunted par force. Haussepieds, as mentioned above, a type of snare that lifts the prey from the ground. 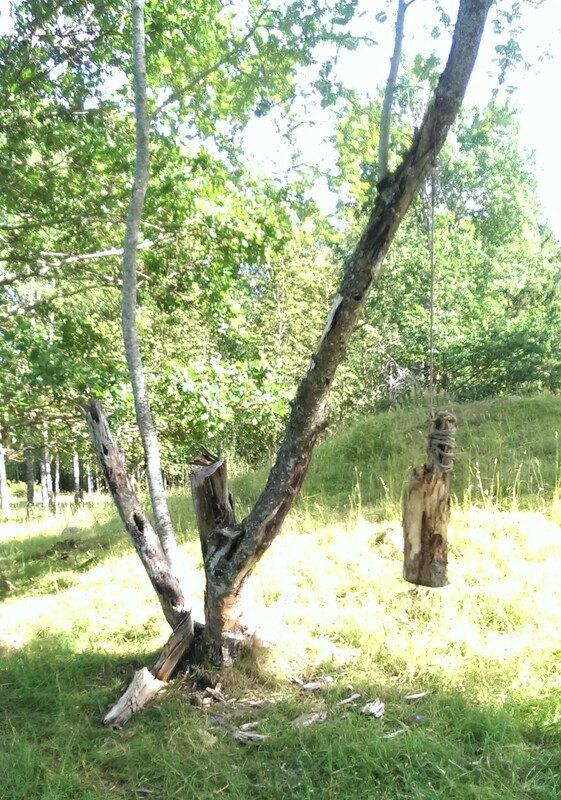 The traps depicted are often quite elaborate, which stands in opposition to some hunters saying that wolves do not return to a place where men have baited. 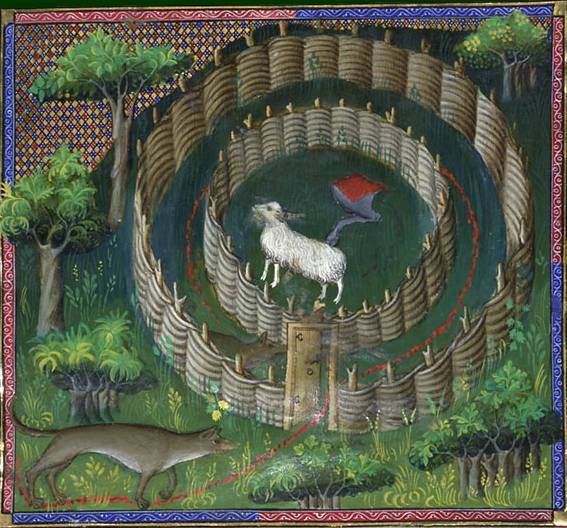 The traps shown are ones that are recommended in huntbooks though, the ones above being from Livre de chasse. 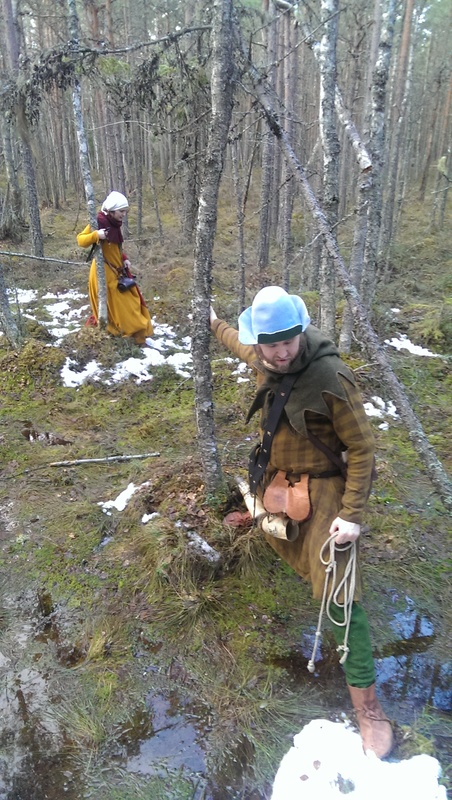 Netting was a preferred way, in Swedish lawbooks the farmers were supposed to have a certain length of wolfnets prepared and was obliged to partake in wolfhunts when ordered to by the king or his appointed local men. The farmers then connected each length to each other making the whole parish combined wolfnet. 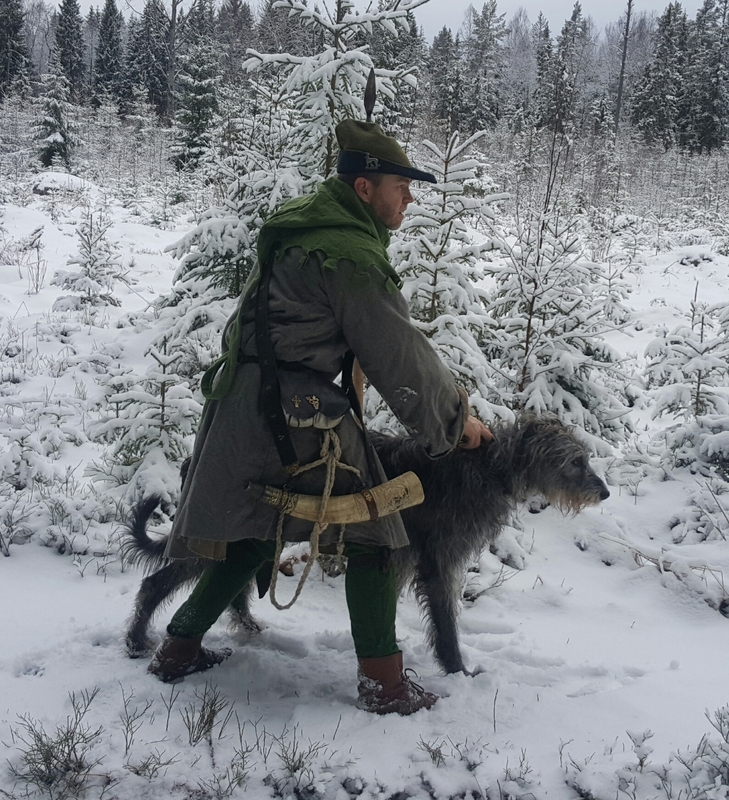 As said before, the wolfhunt was a winterhunt, and when hunting in wintertime, grey clothing was preferred (as we have taken a look at here). Probably due to its camouflaging factors. 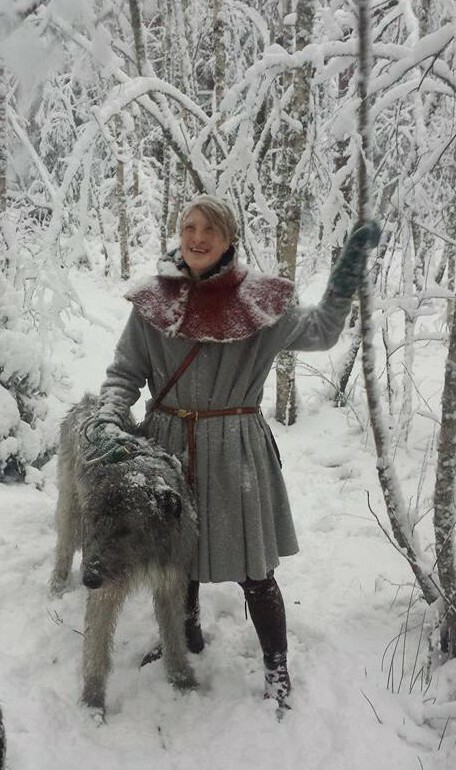 In the pictorial evidence, in most wolfhunts they are wearing other clothes than grey, but… people did as they pleased even then. 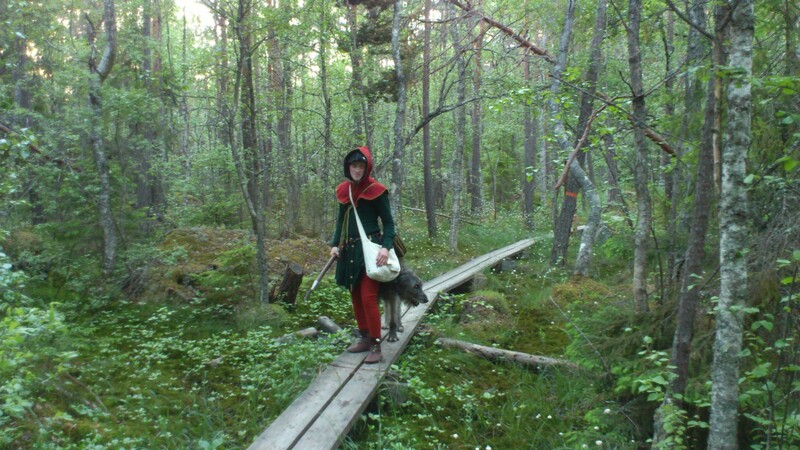 The other clothes I used during this little outing was green, as this is the preferred colour during summer. The good old bycocket hat, as seems very popular amongst hunters, also got to be taken out for a little ride. More on hunters clothing in general can be read here . 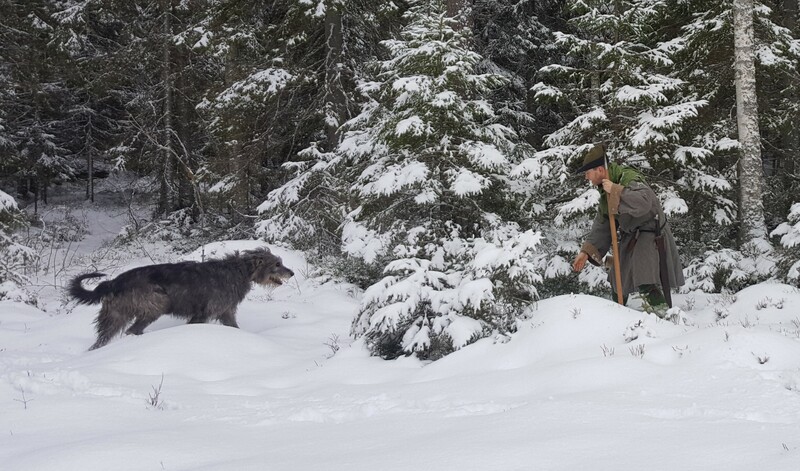 Not all dogs was suitable for wolfhunting. The wolf is a fast animal, and will outrun most dogs. And also uses hiding as a way to escape. the wolf also measures the mettle of the dogs set on him, and if they are not courageous enough it will scarcely bother about them. This gave rise to special woulfhoundbreeds of greyhounds. 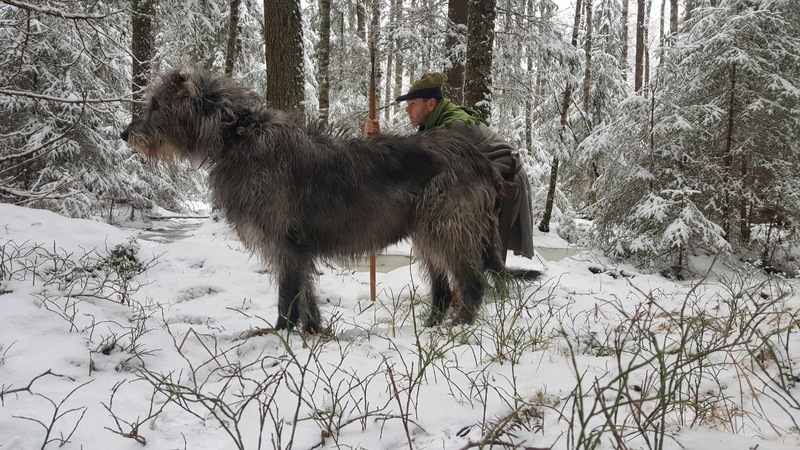 Wolfhounds have been known to be able to single-handedly take down a wolf. Usually by running just as fast and tackle them. Then keeping them at bay by fast attacks to the abdomen. But being tackled by a 75 kilo dog and going down in speeds around 60 km/h is rather a tumbling experience in it self. The wolfcollar The spiked wolfcollar is iconic and has been in use for a long time. 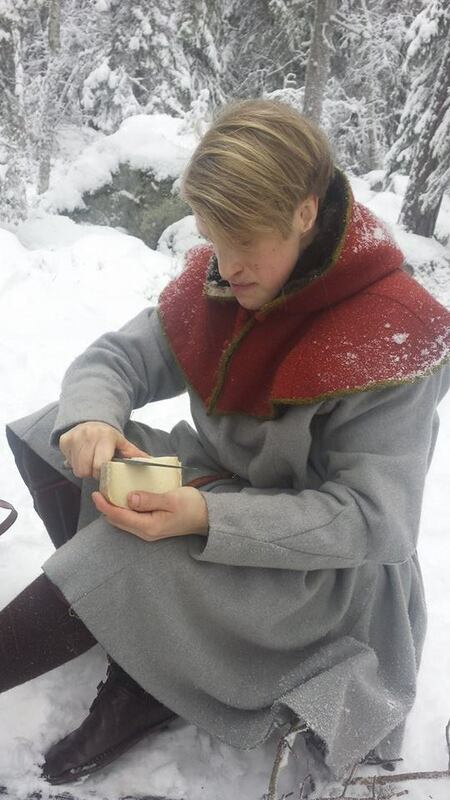 There are several depictions of it from medieval times, and also a preserved Viking age spiked collar from Uppland, Sweden, that we wrote about here. 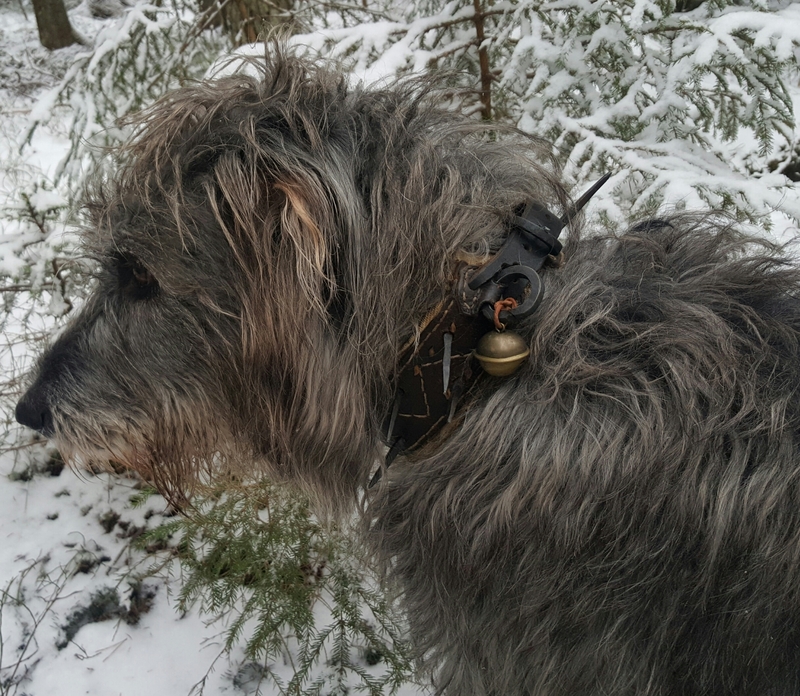 The purpose of this spiked collar is to prevent the wolf from getting its jaws around the neck of the hound to bite it. 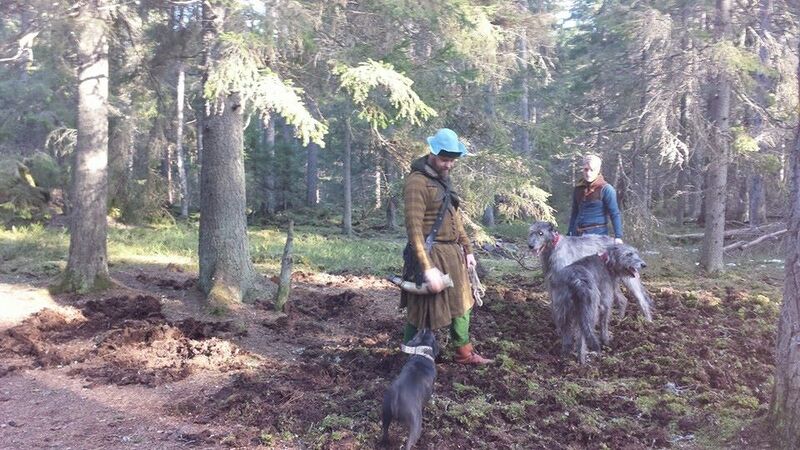 The added bell makes it easier to follow the dogs movements in dense terrain. The spikes does not have to be overly sharp as they will do their job just as well by just being there. This wolfhunter carries a javelin and a sword. The sword in this case being of the Falchion type. 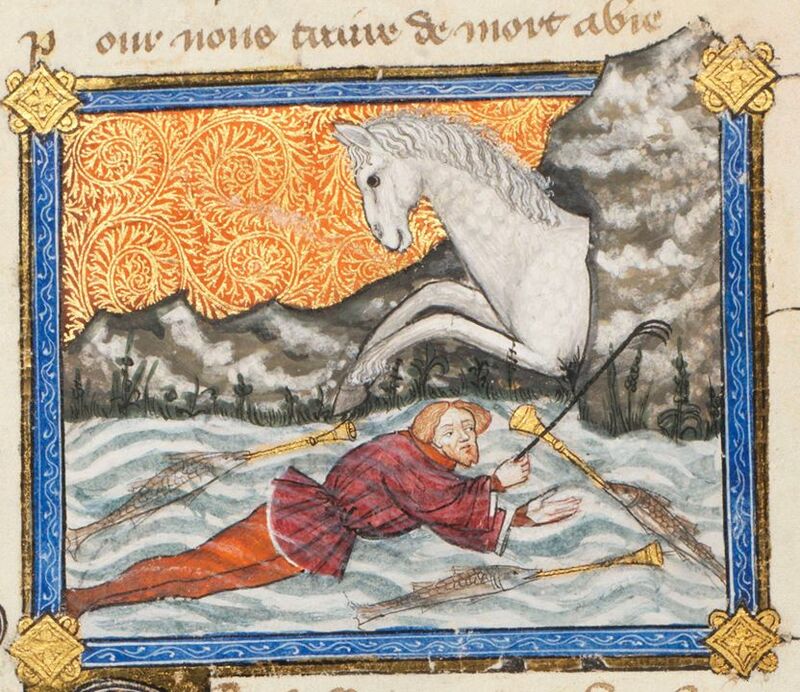 The javelin had, by the 14th century, mostly been reduced to a huntingweapon. As such it is fairly common it seems and it is almost always carried in wolfhunts. The head of the javelins are most often leafshaped and very few have barbs, as one might have expected them to have. I am not sure why this is the case, a javelin that sticks to its target would be better in slowing a target, but it is possible that reuse of the javelin was considered, as it could be picked up and thrown again. To get more information about our thoughts on the javelin, i recomend you to read this. The sword was carried as the main means to kill the prey. After the dogs had catched it, it was killed, and this, the ‘Mort’ was almost always delivered with a sword. Armingswords, long Basilardas, and also falchions are seen brought into the hunt. Stabbing swords are more useful with killing animals, so I am not sure what the falchion, being mainly a cutting weapon, would be good for. but… there it is. 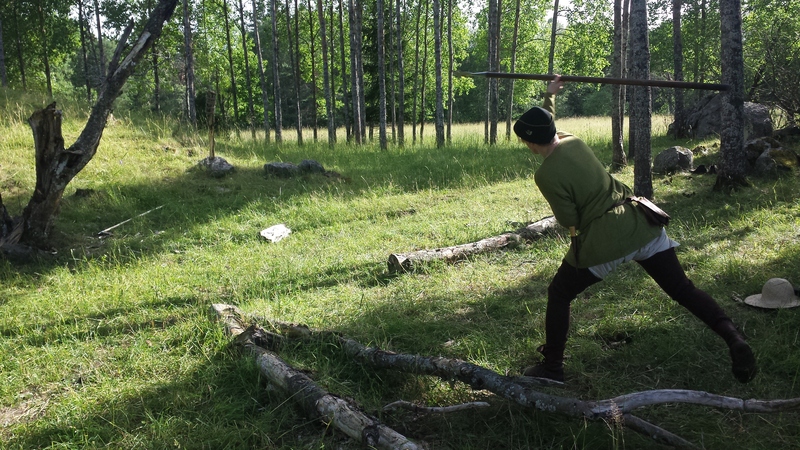 The hanging of most swords, and therefore also the falchion, in later 14th century is often very simple. A loop from the scabbard that goes around the belt. 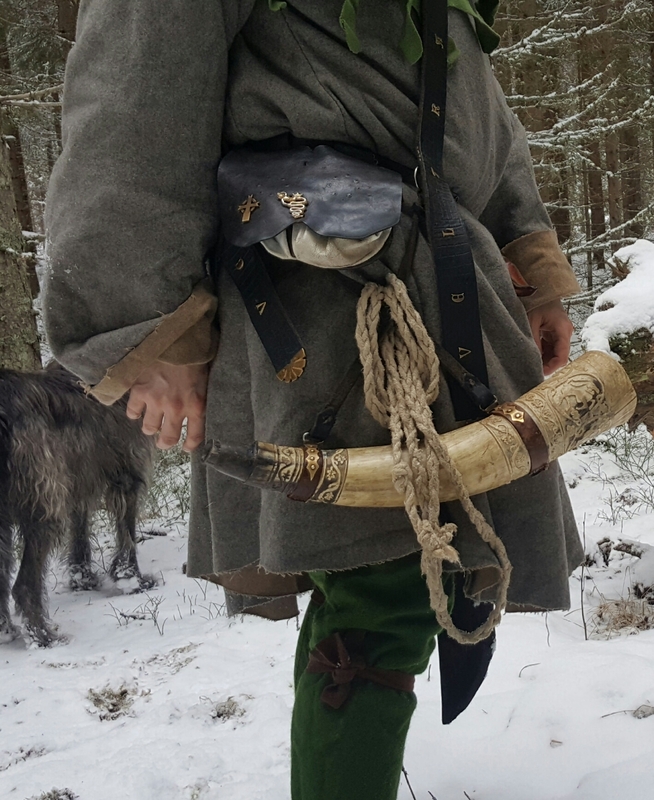 The horn is of course carried as it is the main means of communications during hunts. The Mort is also blown when the beast is killed. It seems it was considered worthy of such honour. The leash is sometimes seen as carried on the horn when not in use. It is suspended from the crossknot of the hornbaldric. 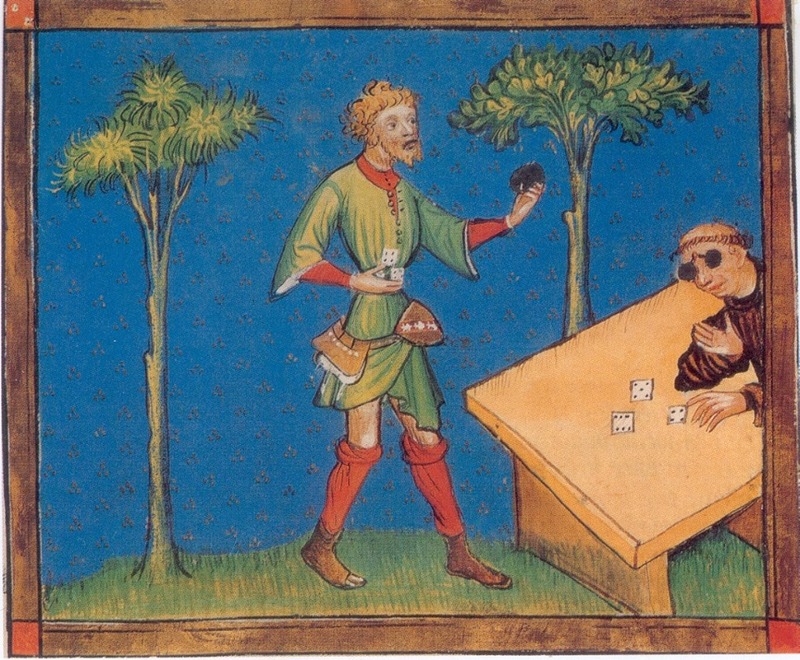 The quotes above is all taken from ‘The master of game’, by Edward of Norwich, and the pictures from ‘Livre de chasse’ by Gaston Phoebus. Both BF and Morgan version is used. Your clothes looks so used! They look authentic worn, stained and patched like that! How do you get your clothes patinated that good? I have no events to use my clothes at! No one makes events with my focus/timesegment. Why is it good to get out? Me: Hey, its supposed to be nice weather tomorrow, forest? Emil: Yeah, we aint been out since two weekends ago. You finally going to shoot that hornsoundingvideo? Me: Naa….. dun feel like it.. I need to check up sources…. lets just.. eat cheese. 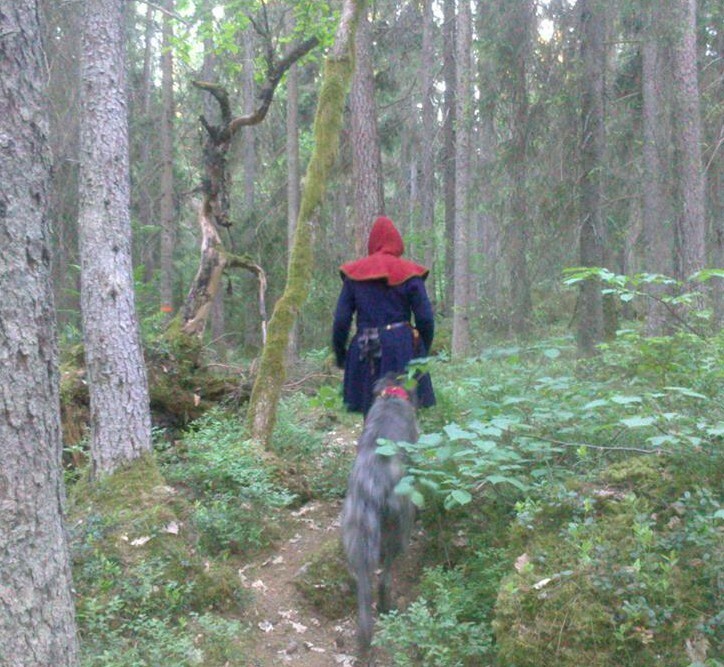 Me: Naaa….. lets take the same one as I’m lazy and don’t wanna walk to far before we get to the actual woods. Events don’t have to be big. Instead of conducting a salmon orchestra of pipers, with a meatfork, maybe just a pie in the park will do? 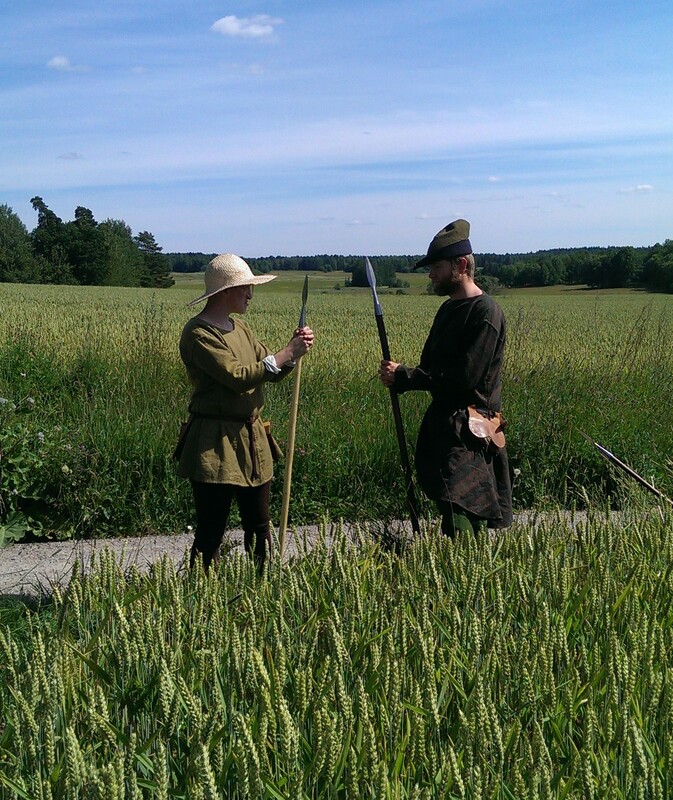 And this is the making of about 80% of our blogposts under the ‘hunting expeditions tag’ (like this one for example) . They usually result in a day or half day of medieval woodsmanship. Time for planning: approx ten minutes. This is an excellent way to keep your medievaling going and get to use your clothes that you put all those hours into making. The next level, organising an event! Lets say you want some more people to join you and not just the ones that are easily gripped at armslength. It still don’t have to be very much work. Just set a date, a time and maaaaaybe some kind of theme (if it doesn’t feel to advanced) and tell people to be there. You usually get more people the longer time they have to plan. A week? You get maybe three to five people. A month? You get maybe ten to twenty. No one ever liked neighbours playing loud music. Keep the event civil. Now, some might think its more work the more people you get. But you don’t really have to do everything yourself. You don’t have to make all the food, get places to sit and tables and all that. Most people like making their own things. That is part of the hobby after all. 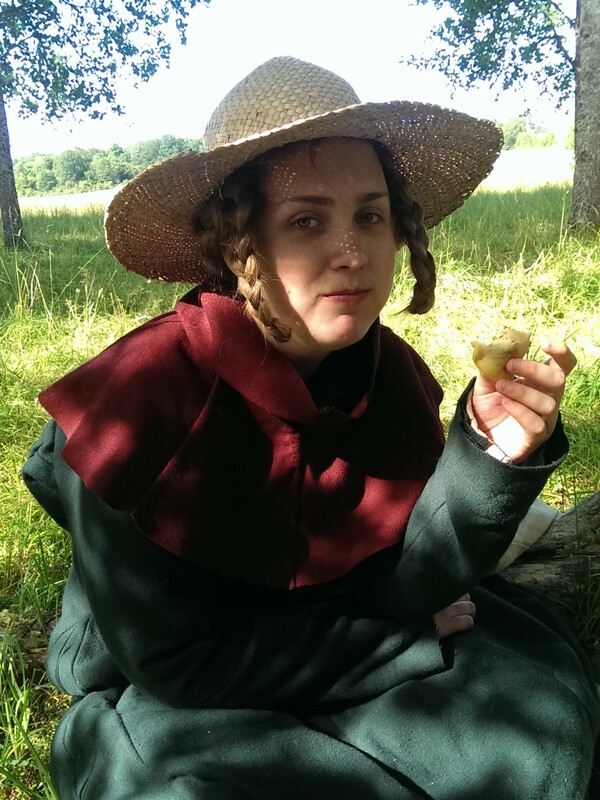 These kind of events can range from rather small and cosy, like the huntgathering, or very big social historical crossovers, like “the ultimate historic megapicnic” , which where both in the form of a picknick and thus not as draining on the organisers. Lets say it is mostly just you that share the fascination of late spring 1378 and you’d like others to play with you. To get people interested there is almost just one way to go around it. Get active. If you build it, they will come. People like to be social, and they like to do things. This is why historic segments with alot of actives, get more actives. Try to get cool pics for Facebook. But don’t get photobombed by shady monks in sunglasses. No one likes those guys. If you want to get a new historic segment started you need to make things people can do in that segment. There is no use to try and lure someone to sew an outfit to clutter up yet more space in an overused closet. As stated above, it doesn’t have to be fancy, but it has to be shown. 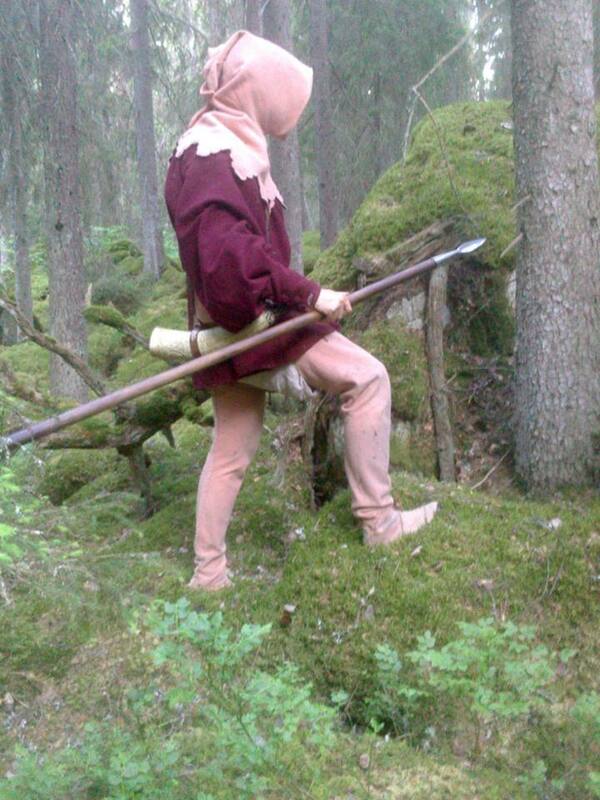 If you are falling down in the forest and noone noticed it on Facebook, noone will ever know. But if you show all and everyone how you sit on a rock, eat a sausage and pokes a worm, they will see how cool it is and want to join. You don’t have to make things big and fancy. Just grab your stuff and go out. This year spring is unusually early in Sweden. The meteorological definition of spring here is that the average temperature must be rising and lie between 0 and 10 degrees Celsius for seven whole days in a row. This happened in mid February where we live, more than a month earlier than expected. My personal definition of spring is different, it craves a close inspection of the signs in nature that the season brings with it. When I see it, I believe it. 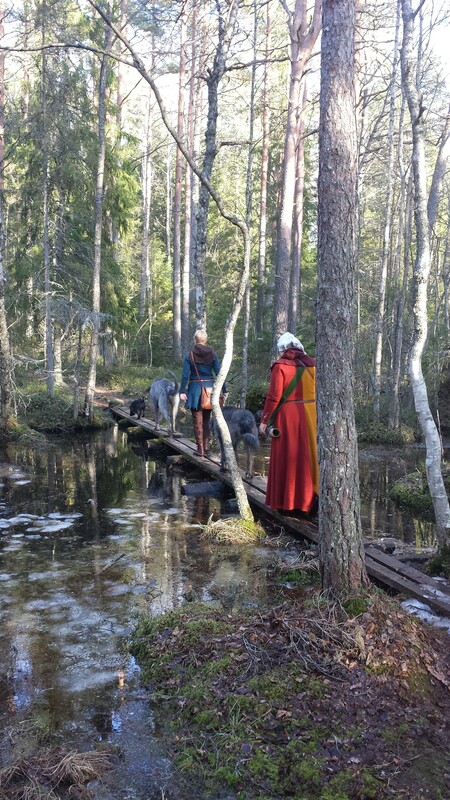 That is why our first spring outing is so important and it was about time we got out in the forest this weekend. 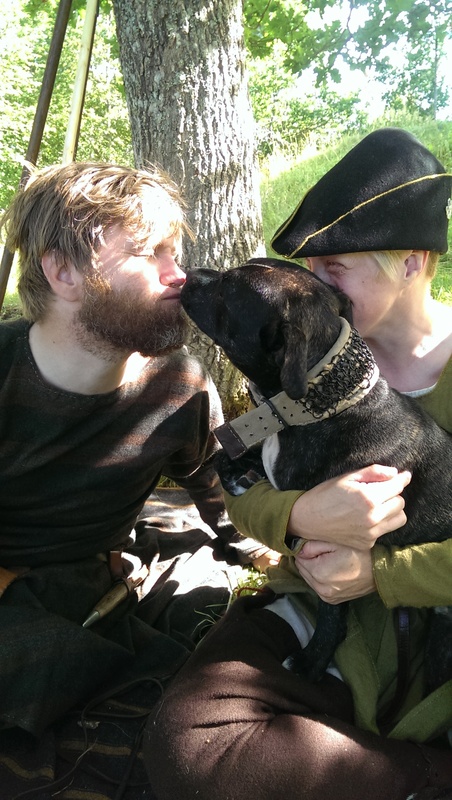 Johan and I was also extra glad that our friend Helena joined us, bringing her energetic boarbaiter Bullen. 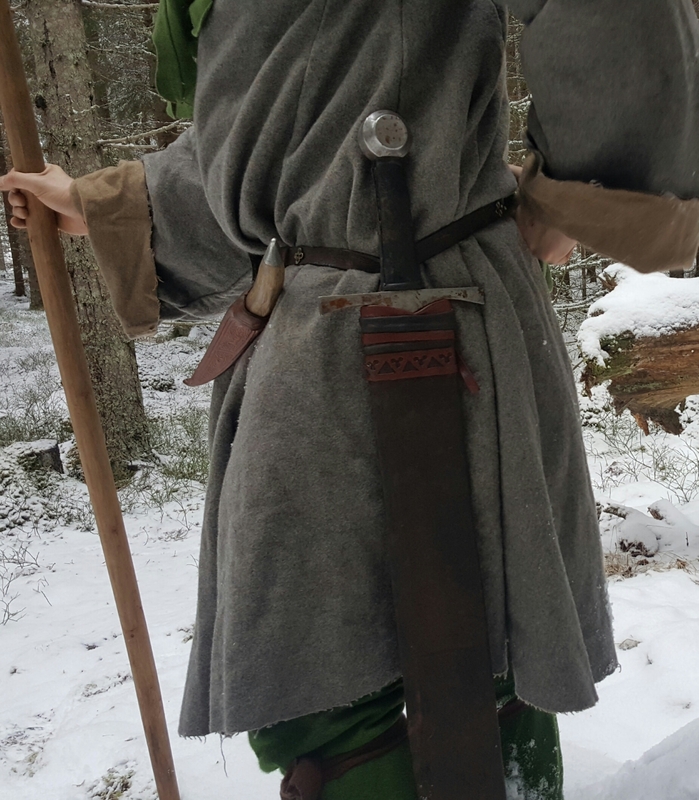 Early spring outings in medieval gear means that you will have to deal with a lot of melting snow and expose yourself to a serious risk of getting very cold and soggy feet. It will take at the least another month before the forest dries up and the melting water is just above freezing temperature. But I don’t expect that the “toughening” effect is measurable after only occasional events of uncomfortable experiences, just like I very much doubt the validity of single attempts on experimental archaeology when taken out of context. To gather valid knowledge based on experience is a long time project, it takes years. But every outing we do makes a little difference, we always learn something new. For me, this outing was not about handling getting cold and wet, even if I did that as well. 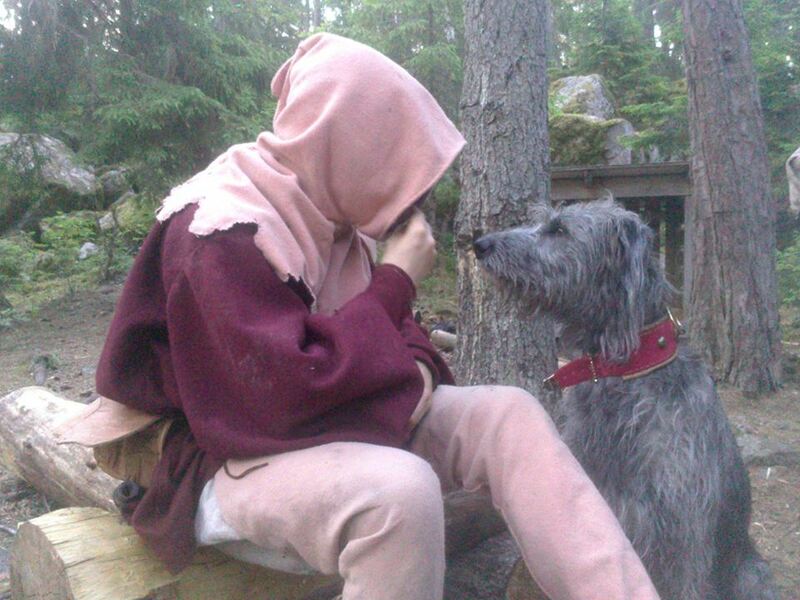 Instead I mostly focused on observing and bonding with my dog, Basilard. He came to me only five months ago and I haven’t had him off the leash much, worrying that he would go off hunting and get in some kind of trouble or another. Now I watched him run happily with the other dogs and he was never out of sight for long. He only reacted to the scent of game once or twice, as when we found massive boar-marks in the ground. I learnt that I had to take a chance more and trust him a bit to see the result of all the training we have done. After walking through the marches all of us had achieved the expected status of wet shoes and cold soggy hose-feet, but with a varying degrees of experienced discomfort. However I think we all equally enjoyed our little sit-down as we made up a fire and had a light meal including wine, cheese and some extraordinary tasty sausages. Making a fireplace by folding up the moss. The subject of fire makes me think of our next project. This year we have decided to make an effort to better ourselves as fire-makers. 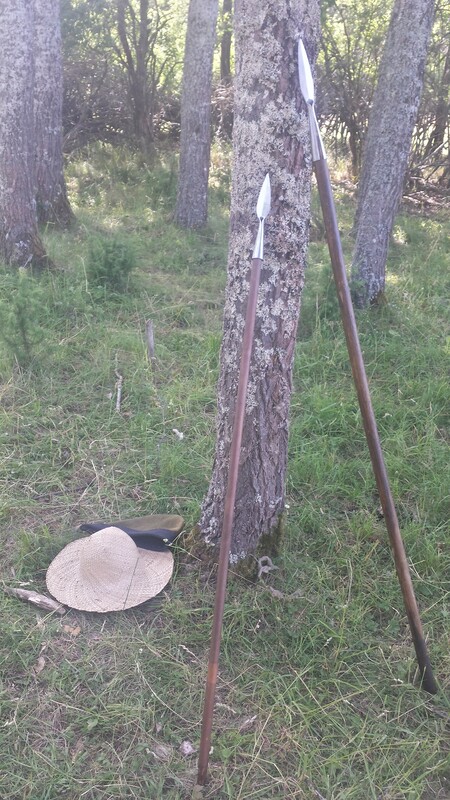 We will practice to use traditional tools and methods to a further extent than we have done so far. 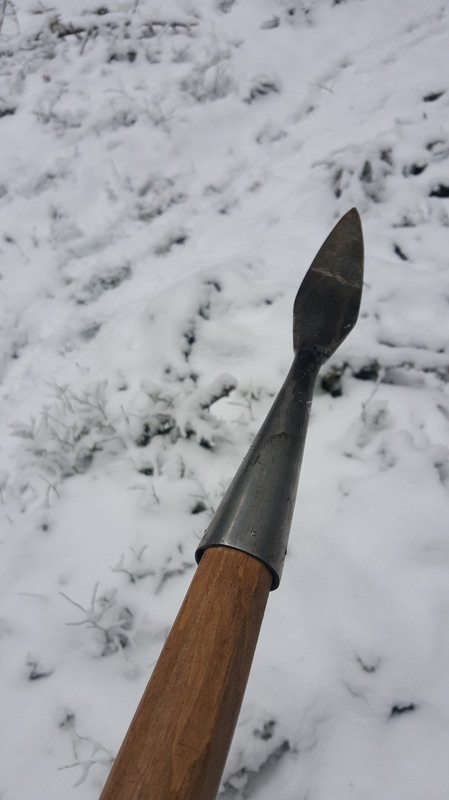 I used to be proficient at using flint and steel but that was a very long time ago and I am looking forward to pick it up again. I imagine I’ll do a short video or an article about our progress with this project. As for signs of spring except for wet feet on wanderers in the woods, there was birdsong, budding leaves and little rivulets flooded with water. There still was occasional heaps of snow and the moss crackled with frost on some places, but also sprouting tufts of green on the ground. Most importantly, there was a few extra hours of daylight available for us now compared to when we did our last outing. All in all, what I saw was well enough for me to decide that spring is truly here. You can see all the pictures from our outing in our Facebook-album here. Yesterday I woke up to a snow white landscape. I knew it would be one of those precious winter outings, my favourite. 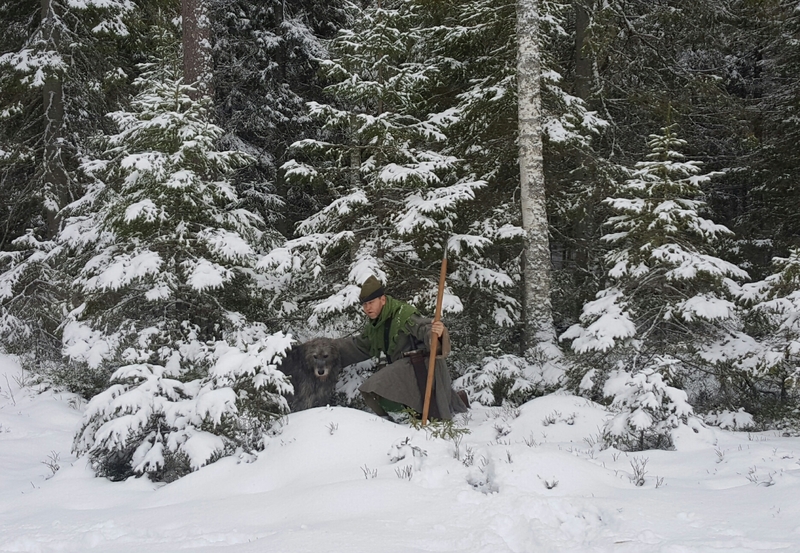 All seasons in the woods have their charm and beauty, but I have come to especially like cold weather because of how snow and ice really puts my kit and my skills to the test. I like to use my gear in different weather conditions to see if my craft and gear hold water, sometimes quite literally. This was not only our first outing in snow for a long good while and Basilards first one ever. 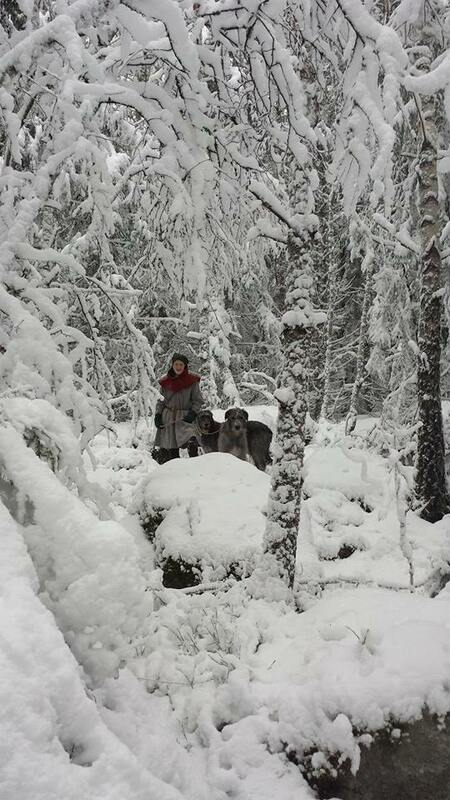 It was also première for our new grey kirtles, the winter clothing for hunters as recommended by Gaston Phoebus. We had a heavy snowfall the day before but it was not very cold, just about -5°C/23°F. That means cold enough for nice dry snow, but not so cold it hurts if you dress accordingly. Dry snow is lovely to be out in, but wet snow can be difficult. Thaw is soon absorbed by our thin leather shoes and becomes freezing water. It makes your hose soggy and your feet hurt with cold until they numb. After some time walking in this state of misery, the damp permanently damages the shoes as well. Dry feet in dry snow. You can never know if the weather will change when you are out, so I always grease my boots the day before a planned outing and it helps a little. 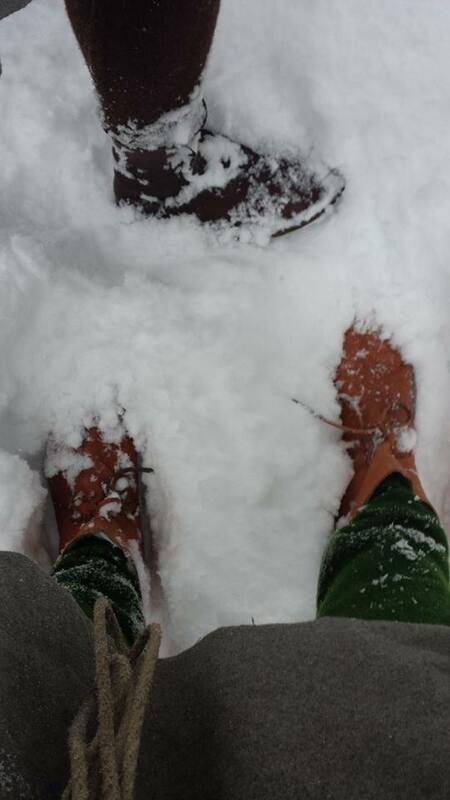 As long as you keep moving it is usually alright, but even in dry snow our shoes absorb some water after a while. The thin leather sole is then half frozen, constantly warmed by the foot and cooled by contact with the ground. This gives you a better grip than you might expect if you are used to walking in rubber soled shoes on ice. 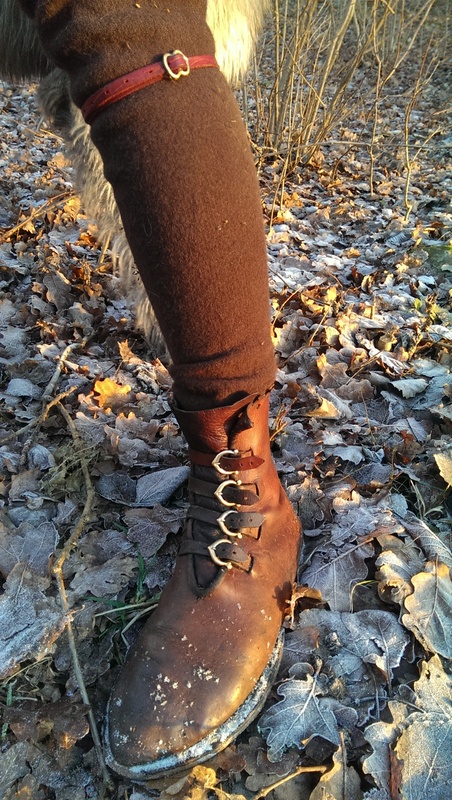 Boots with many buckles like mine are not the most common ones in period pictures. When they appear they seem to be worn only by the most wealthy in society. I had mine made for me three years ago after archaeological findings of shoes from 14th century Stockholm. I too feel that they are a bit luxurious, but usually I’m very happy with them. However, on previous winter outings I’ve sometimes had trouble with snow getting trapped in the shaft and slowly melting there to my discomfort. It happens when the shaft is too low or not tight enough around the ankle. 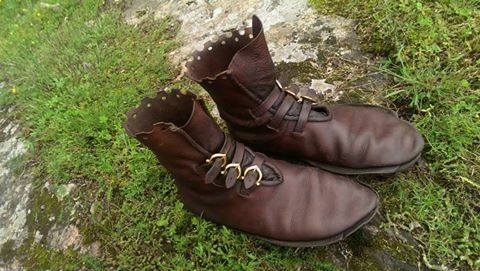 Recently I had a friend who is a really good shoemaker help me put on an extra pair of buckles to solve the problem. It worked out very well, kept the snow at bay and I think it looks great. Thank you Sofia! I had been looking forward to this outing for some time, longing for snow. Now I plunged my way through it with childish delight and Basilard seemed to enjoy it as well. He was on his best behaivour all day, but I doubt he has ever seen so much snow. This was really good training for him and I’m glad that he goes so well together with Johans Boudica. Fur lined hood makes one happy hunter. Both Johan and I had put on our hoods lined with rabbit fur for this occasion and agreed that it is the best winter garment you can get. It is easy to regulate the warmth by pulling the hood up or down and it protects your neck from snow dropping from the trees. The fur gives you that instant warm fuzzy feeling that makes you all glad when your ears are nippy. 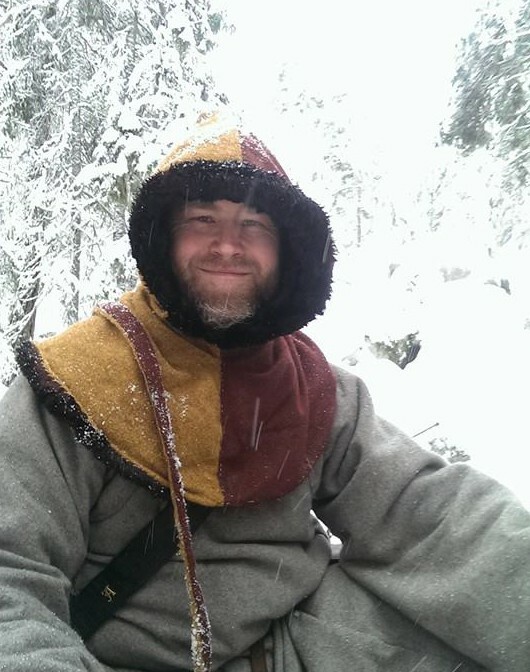 Except for my hood for warmth I also wore fur lined mittens and three layers of wool kyrtils. The most thin and soft one closest to the skin to keep me dry and then increasingly more thick and coarse fabrics on top to keep the snow out. The new grey kirtle got heavily felted when I dyed it and turned out almost water-proof. The massive width makes it drape nicely and the folds of the fabric make little pockets of air, soon warmed by the body. I didn’t freeze one bit. 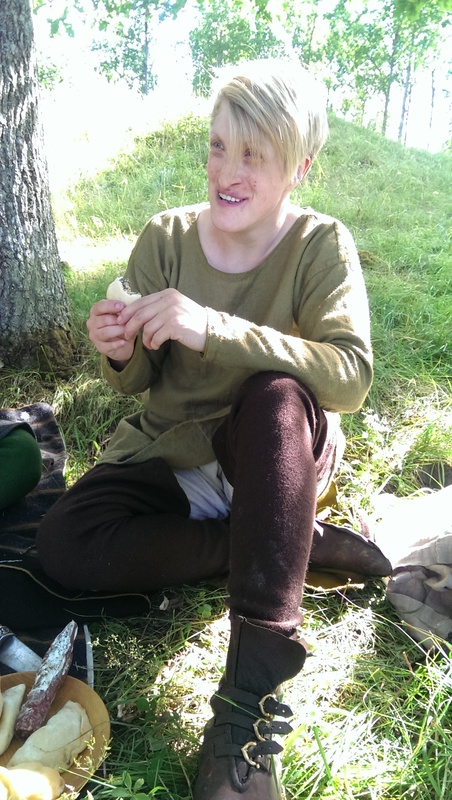 Johan was happy with the extra long sleeves on his new kirtle. 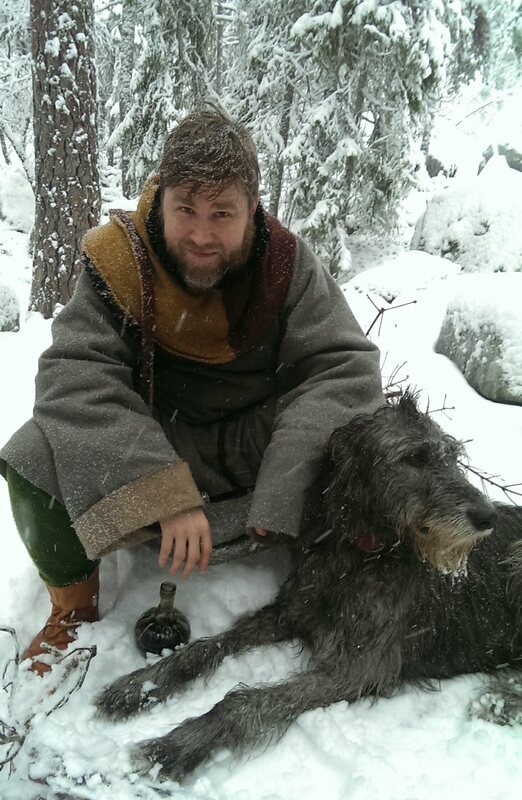 Gloves and mittens are sometimes a bother when you are out and about, holding horns and spears and dogs and whatnot. But folded down, the sleeves keep the warmth around the hands even without gloves, and you will not likely loose them in the snow. 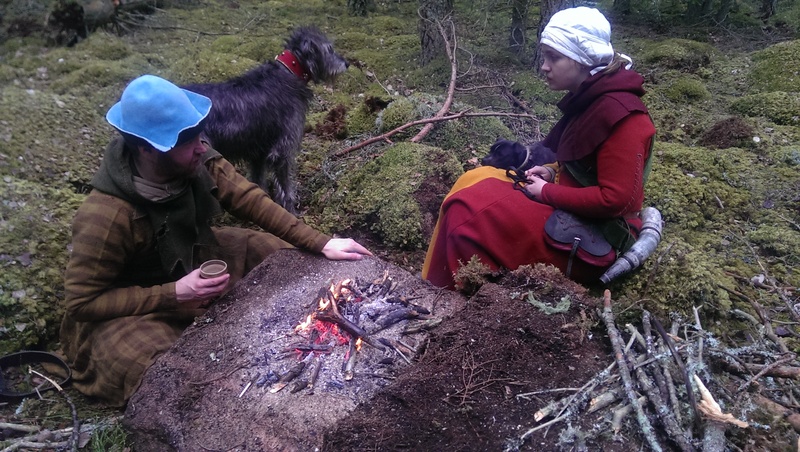 We stopped for a light meal as usual, but this time we skipped making a fire. We were both warm enough anyway and most wood was deep frozen. If there had been a need for it, we could probably have found usable branches up under firtrees, but we didn’t feel the need to scavenge half an hour for it. Instead we gave the sausages meant for cooking to two very happy dogs and just had the wine and cheese for ourselves. 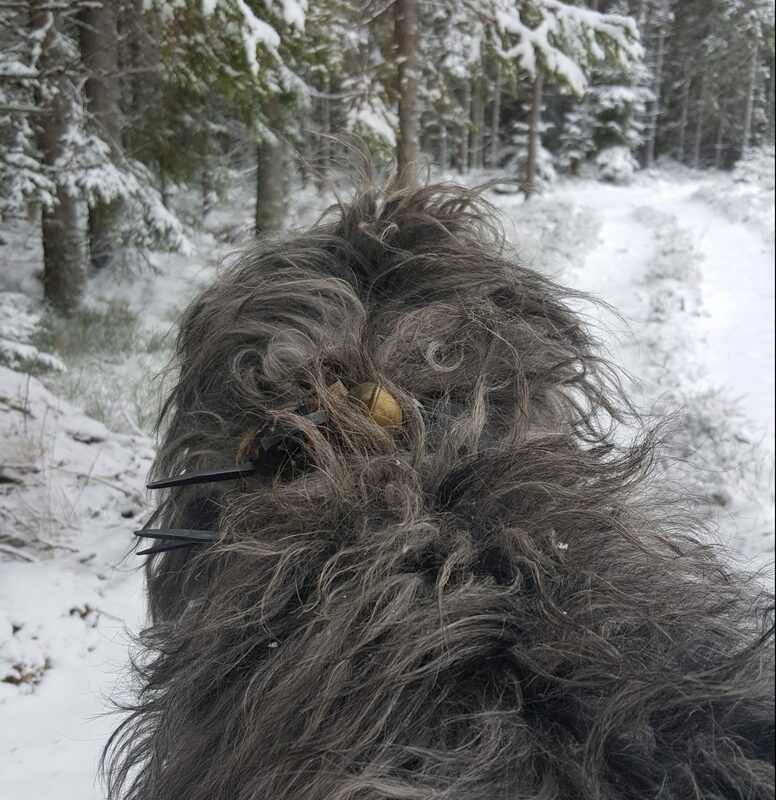 The tracks we saw told us that we were alone in the woods that day, apart from its inhabitants of wild boar, hare and roe deer. All in all, it was a lovely day out. Want to see more? Check out our FB-album. 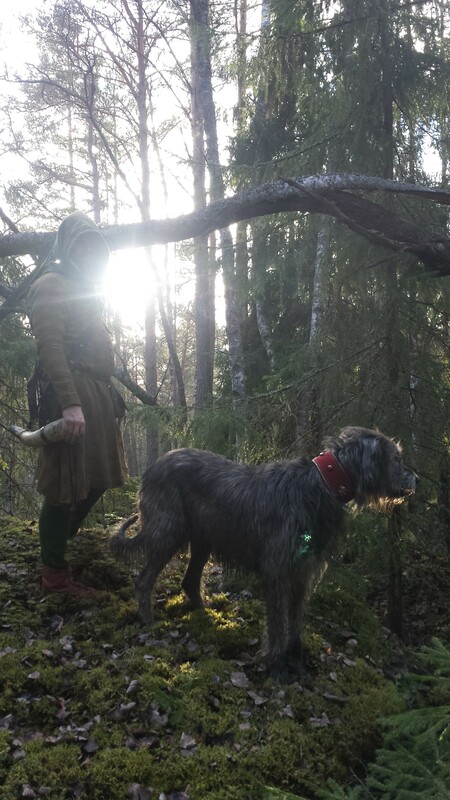 We hereby invite you all, hunters, nobles, lords and ladies, dog-keepers and local farmers to gather and make remembrance of St: Eustace’s martyrium. 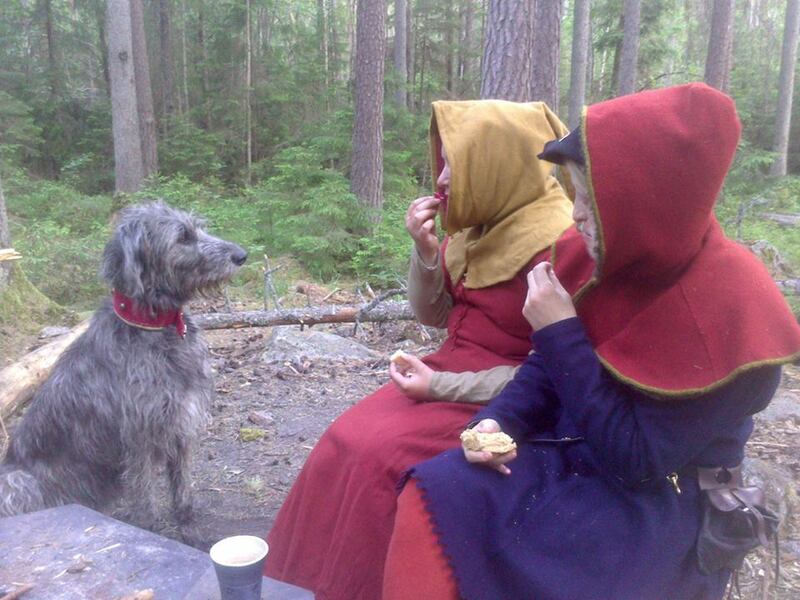 In honour of St: Eustace, the patron Saint of hunters, we celebrate his feast day on the 20th of September with a 14th century picnic in the woods outside Uppsala. This will be done as a reenactment of a scene that take place before a great hunt, the joyful gathering of the hunters. 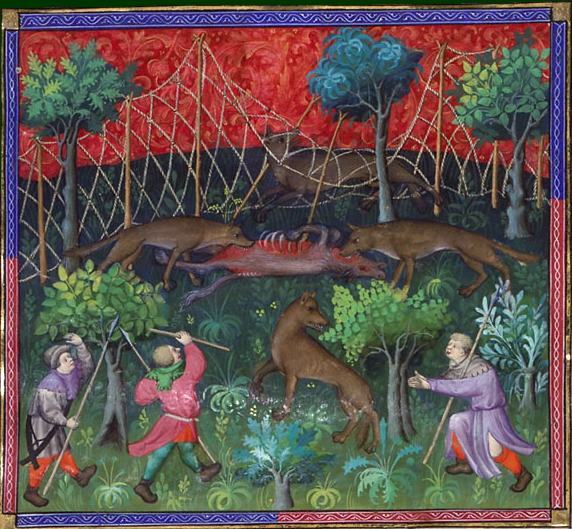 How the gathering of the hunters should be done is carefully described in both period illuminations and texts from medieval hunting books. And also they that come from home should bring thither all that they need, every one in his office, well and plenteously, and should lay board clothes all about upon the green grass, and set divers meats upon a great platters after the lord’s power. 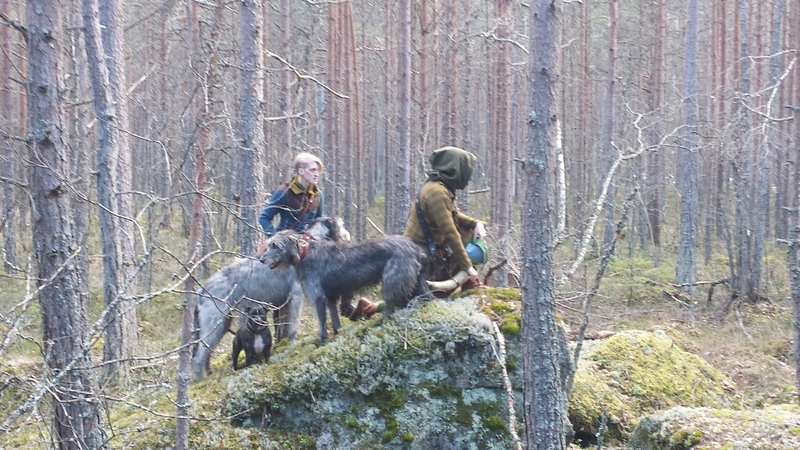 This event is a reenactment of the gathering of the huntsmen before going out on a great hunt. It means that it is a social event and no hunting will be done. 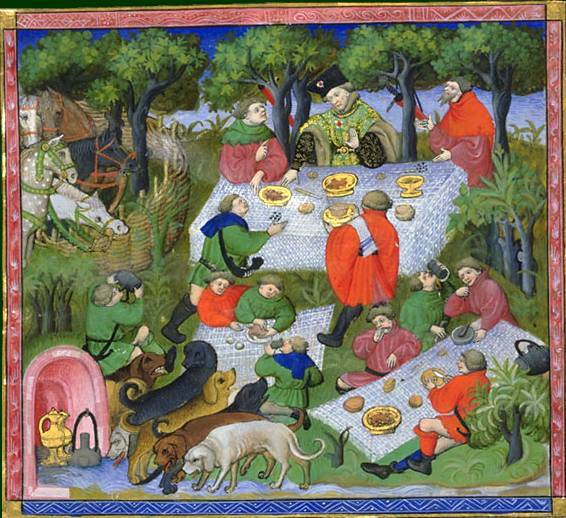 However it is a most suitable opportunity to eat and drink together or perhaps engage in playful games on a medieval style picknick. More info about activities during the event will be added later on as participants confirm their partaking. 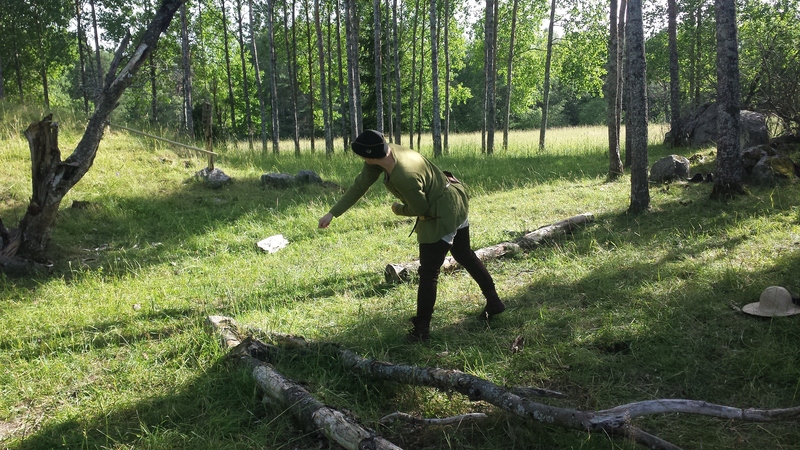 The celebration of St:Eustace will take place in a beautiful groove of old oaks in Hågadalen wildlife reserve just outside Uppsala (Sweden) on the 20th of September, 15:00. 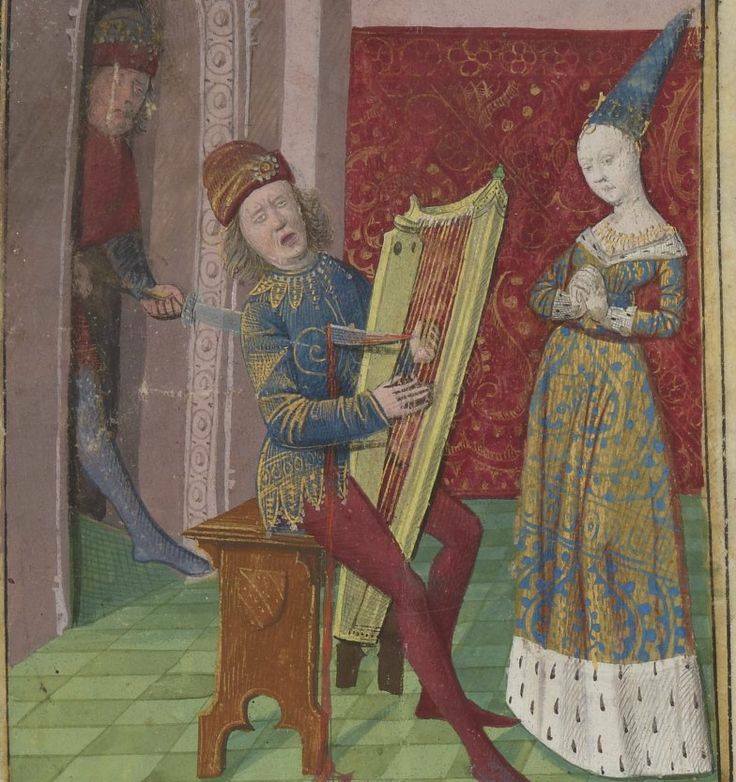 To partake you will need an outfit probable for late 14th century (1350 – 1420). Our definition of “probable” is not necessarily an entirely hand-made outfit, but of period cut, materials and colours. Modern personal items such as glasses are not allowed, we ask you to wear period equipment instead. Modern haircuts, visible piercings or tattoos must be hidden. Bring your own food and drinks. If you have any questions or are uncertain about the appropriateness of your kit, please feel free to contact us on our Facebook- page and send us a picture. Confirm your application on the event-page on Facebook. We are looking forward to seeing you in September, very welcome! A misty grey light over the forest, a new day dawning. In Sweden in early July, there is no night. The sun never sets, so it never gets dark. You know it is night-time during the hours when the birds keep quiet. Now they sang again, so our short rest was over due. I felt like I hadn’t slept, just closed my eyes for a moment. But it was time to get up and see if we could spot any game on the move. A hunter and his hound crossing a field before dawn. 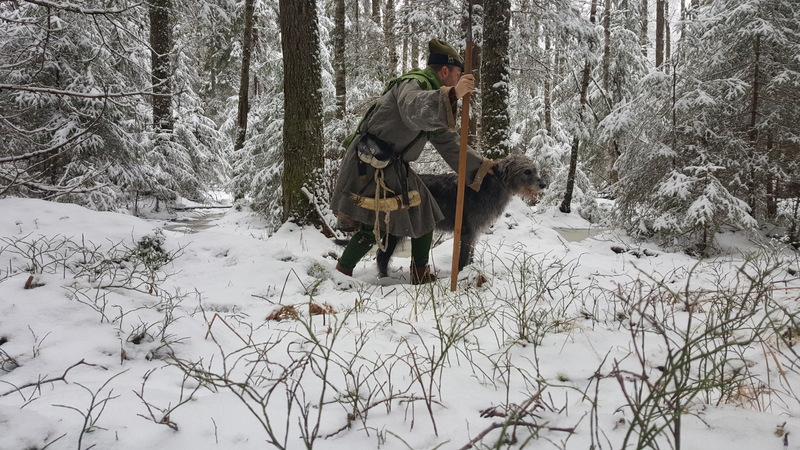 This hunting report is from an earlier expedition we did in July last year, one of our first visits at the field where we tried the Bell-rope tick I wrote about earlier. We had planned to stay out over night as we wanted to try to watch the game on the move at dawn, drinking or grazing. Johan, Frida and me got our gear together and walked out in the woods in the evening. 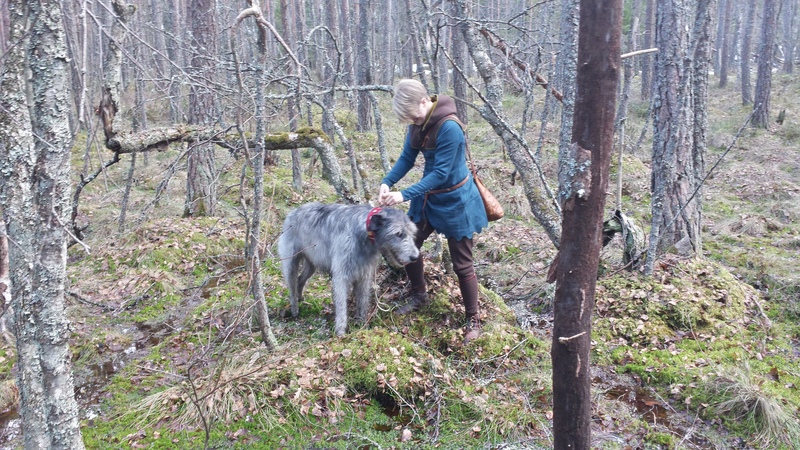 Boudica, their Irish wolfhound was tagging happily along our trail. Frida is a tough one, she walked all the way to our camp site with nothing but thin leather soled hoses on her feet. 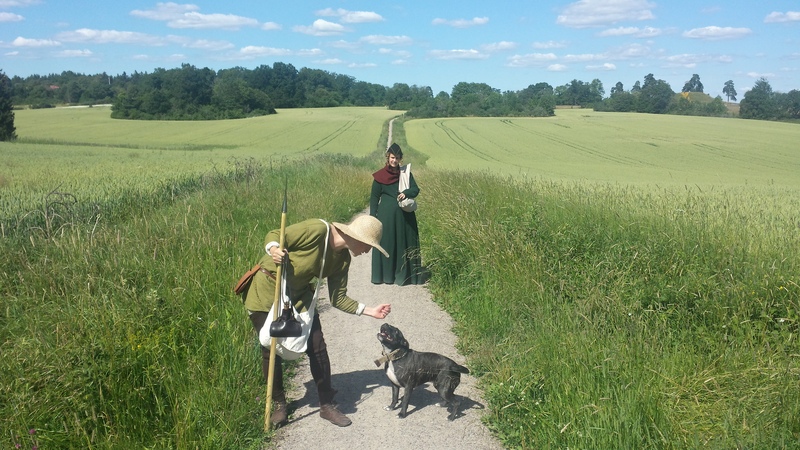 Her only pair of medieval turnshoes gave up during her pilgrimage on Gotland a few weeks earlier. 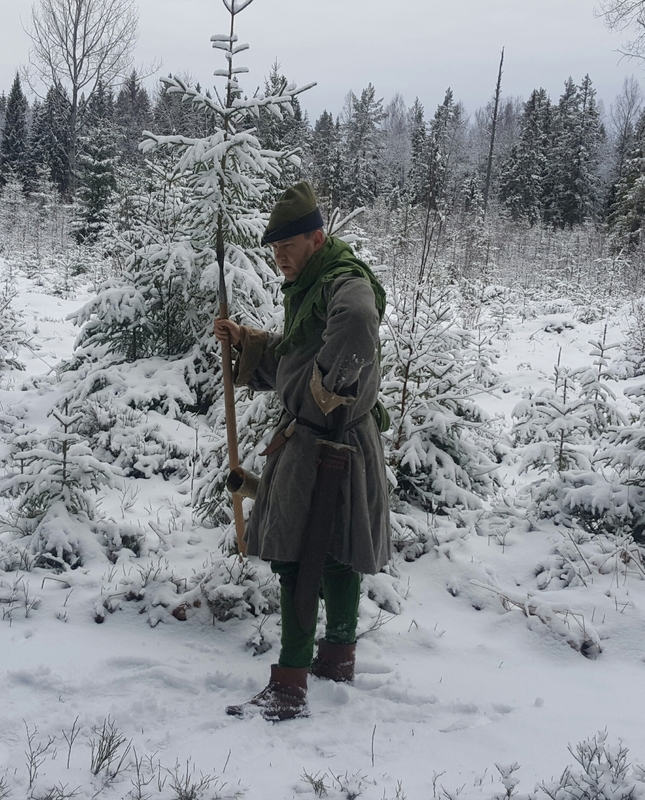 But when we look on contemporary pictures of 14th century hunters on foot, it is not uncommon to see hunters without shoes. Why is this? Did the hunters want to spare their shoes or is it easier to sneak about without ’em? 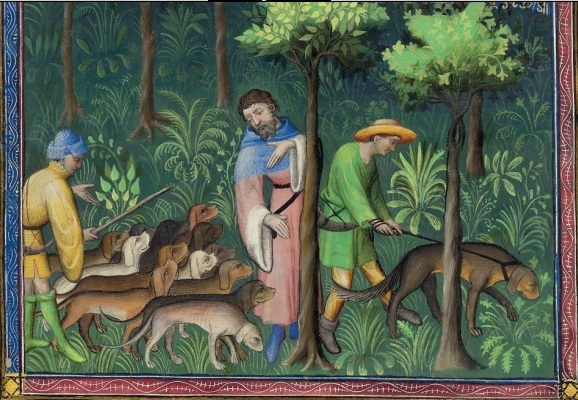 To me it seems that at the least in Livre de la Chasse it is often the doghandlers that go for the shoeless look. I have no idea why. Our doghandler decided to try for himself. Johan claims that he could sneak twice as good without shoes as with ‘em. But I also heard him swearing occasionally when hurting his feet. In short, I’m not entirely convinced about the success of the barefeet-concept. I think I’d rather keep my pretty boots on. Me crossing a bog in full blossom, late in the evening before arriving to our designated camp site. 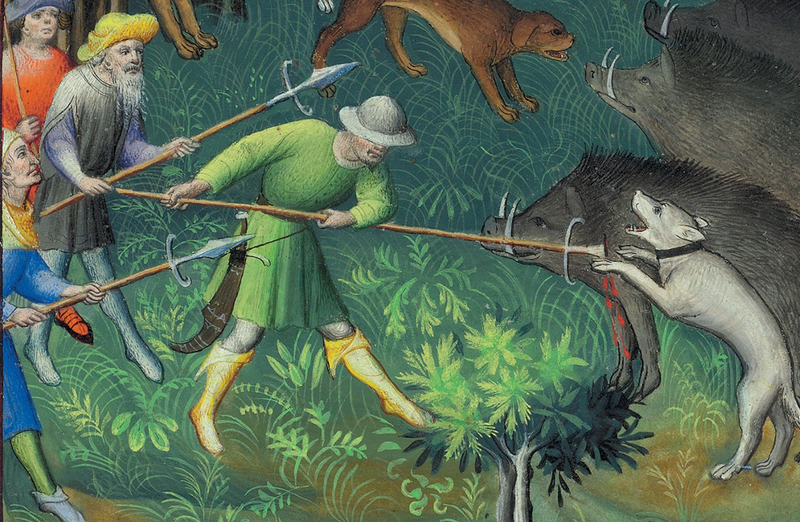 In medieval times hunters, poachers and maybe occasional swine herders or coaler’s were the only ones moving about in the forest. The woods was unfamiliar, road-less, wild and dangerous ground for most people. The deep forest was believed to be inhabited by criminals, outlaws and dangerous creatures – and it was. Our folk lore from the time tells us about a rife fear for werewolves, but the fear for predators like wolf and bear must also have been very real. Today it is quite the opposite. Many of us enjoy outdoor life just for fun and are used to it since childhood. 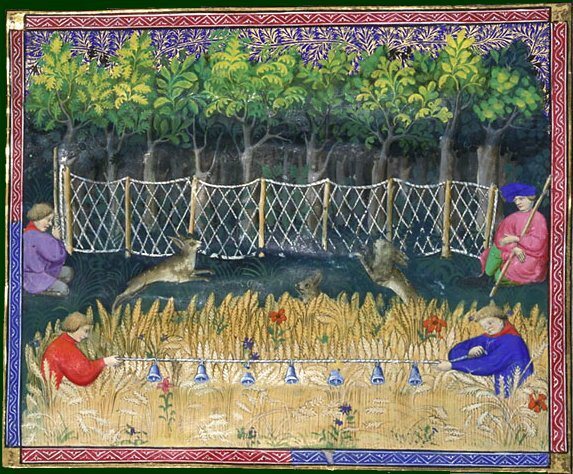 I like the idea of reenacting the medieval hunt because it is so easy to do for leisure. Where we live it is never far to the forest. Most of the year you’ll need no tent or other heavy gear if you want to stay out over night wich gives you a great freedom of movability. In Sweden all flowing water in the forest is drinkable so you can easily refill your water bottle. Clothes of wool, a single blanket and good company is enough for warmth at night if you have shelter from the wind. The camp fire experience is essential for every hunting tour. When arriving at our destined camp site late in the evening, it was about as dark as it would get. 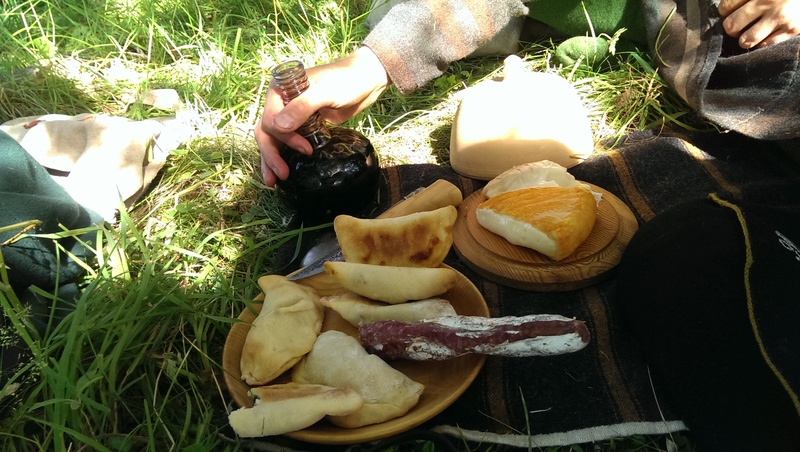 We gathered some firewood and then had our dinner; marinated grilled meat, wine and a nice piece of cheese. By midnight we called it a day, rolled out our blankets by the glow of the fire and tried to get an hour or two of sleep before dawn. I tucked myself in beside Johan and the dog rolled herself up against my back, sharing her warmth. Within short everyone was snoring lightly. It was not long before the birds began to sing and we woke up to a new day, only hours later. Dawning and birdsong. A misty grey light over the forest. 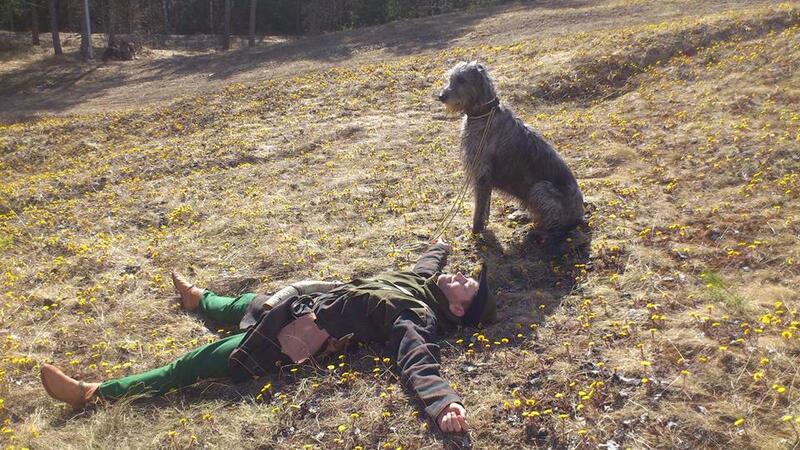 As Frida was’nt interested in our scouting business, Johan, the dog and I left her sleeping in camp. Soon we found our way to a small pond where we hoped some animals would come and drink. 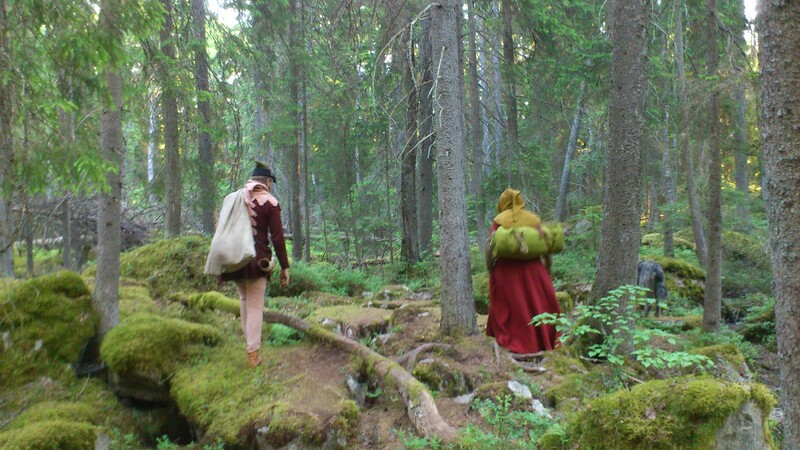 We sat in hiding and waited for a long time, watching and listening at the sound of a forest waking up from the short Scandinavian summer night. We waited and waited. Then we walked and walked, as quiet as we possibly could. Waiting and walking are the essentials of every hunt. 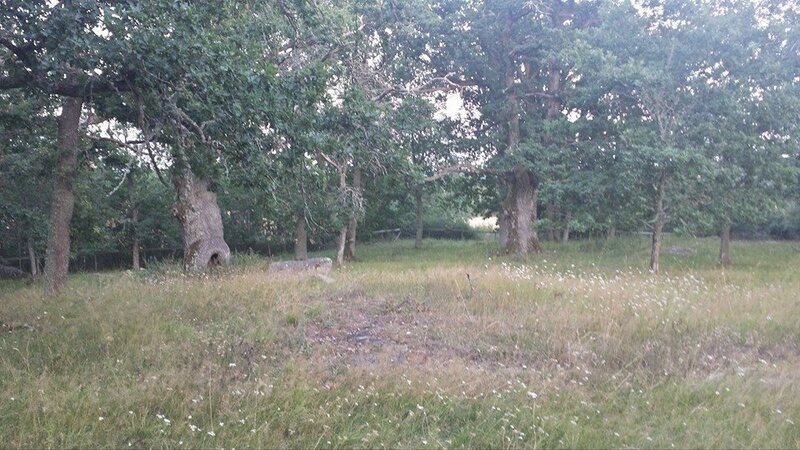 We changed our hiding place a few times, trying to sit by the edge of a lovely green field and on a place where we had seen plenty of tracks of roe deer. We were out for about 1,5 hour and saw the sun rise over the fields and the forest. But even though we were very quiet we saw nothing but a few birds. Yet the woods was magically beautiful and it was all worth it anyway. When returning to camp, we were surprised to be met by a burning camp fire. Frida had prepared breakfast for us! But the doogkeeper shares his rations with the beast. Tired hunter walking back home, early in the morning. 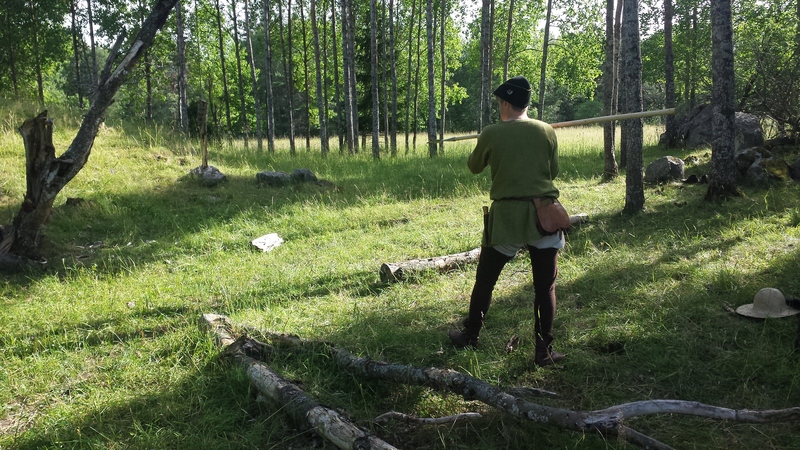 One of the first medieval hunting techniques I remember Johan told me about is the use of a long rope with bells tied to it. I call it “The bell rope trick”. 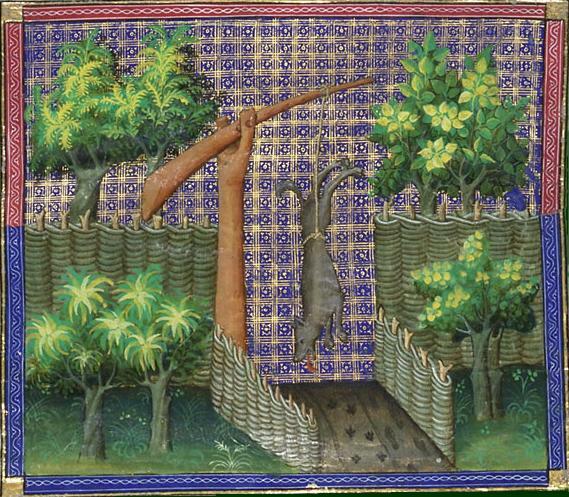 It is depicted in Livre de chasse, a handbook on hunting from around 1388 written by Gaston Phoebus. 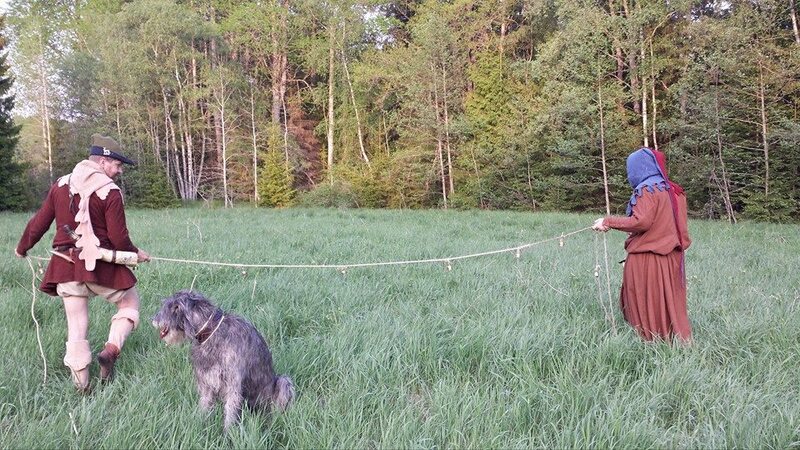 The rope is stretched out between two hunters who walk with it across a field to drive up small game such as hares towards the end of the field. 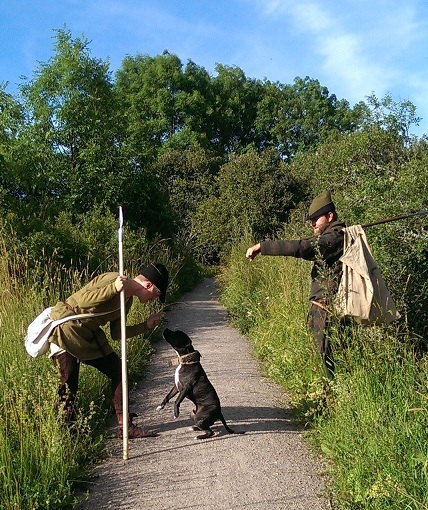 There the hares are welcomed by other hunters with a net, spears or clubs. To drive the game by making noise is in no way unique but I think the bells adds a bit of glamour and makes it look like a lot of fun. 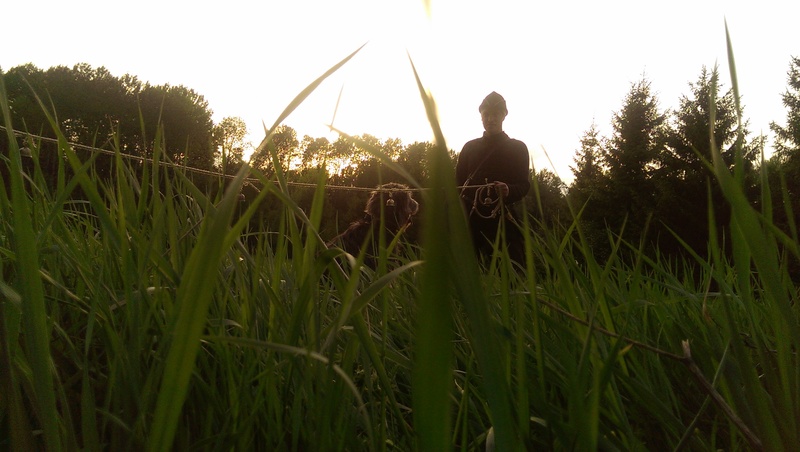 I have not yet managed to tie myself a proper net, but Johan did his part last month when purchasing a range of brass bells suitable for the rope. As we can’t legally kill anything, the net is not essential and we thought it worth a try – perhaps we could stir up a few hares anyway? Stretching the rope with the bells on it. 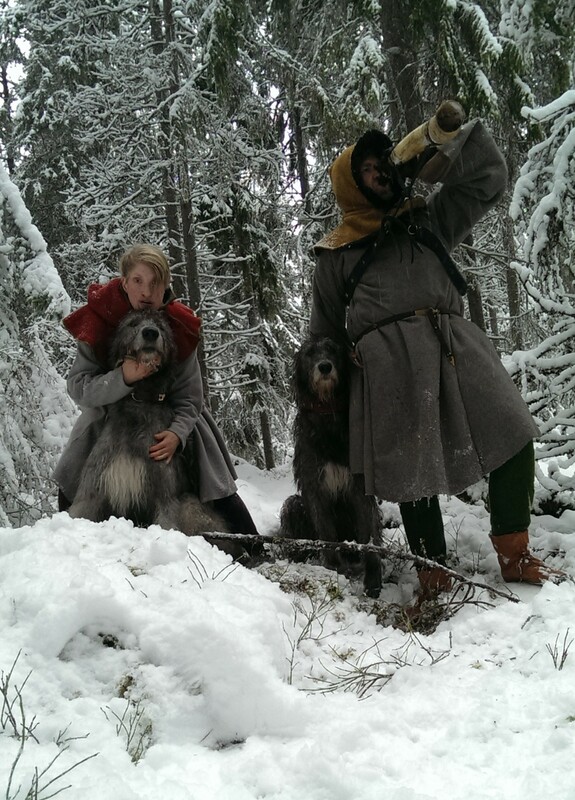 For this hunting expedition we were accompanied by our friend Helena. 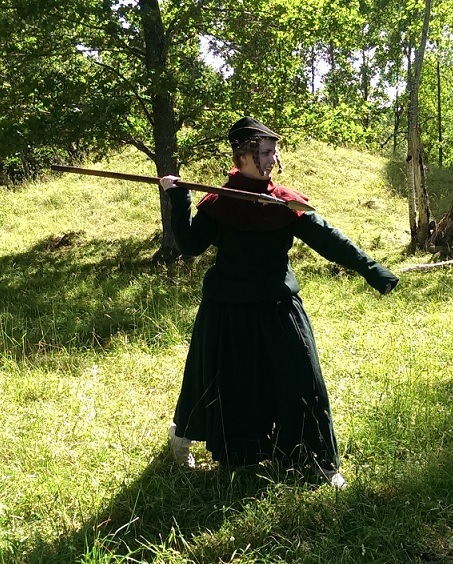 One of the advantages of reenacting the medieval hunt over other other aspects of medieval life is that women seem to have participated alongside with men. They are depicted doing the same things as men, often with their kirtles tucked up in their belt to allow for easy movement and without the linnen veil otherwise worn by most grown women during this period. 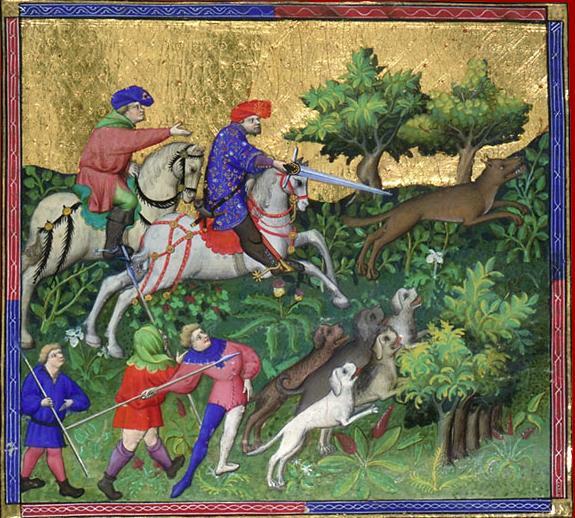 These pictures below are from the same French manuscript, but there are many others and the topic of women hunting will need a post of its own in the future. 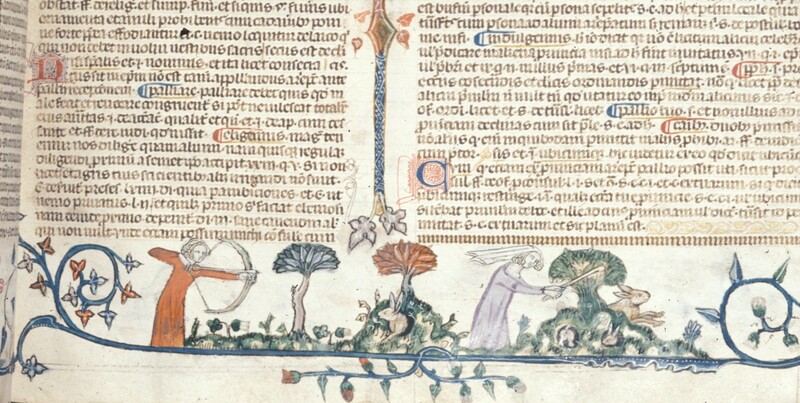 Women hunting hare with bow and a club. 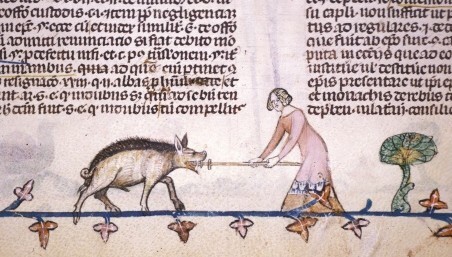 A lady spearing a boar. From the perspective of our game for today, the hare. We hit the outdoor rabbit hutch field in the late evening when we expected the small game to come out and graze after a really hot day. The field of choice was located far out in the woods. We saw lots of rabbit holes in the ground nearby, so we moved against the direction of the light breeze to try to prevent the animals to get our scent to early on. But once Johan had positioned himself at the edge of the field and the bell-rope was spread out, there was no longer any need for silence. It was time for the rope to sing. Sadly, we could not raise any hares from the field this time. But just as I had thought, the bell rope sang beautifully in the wind and against the high grass on the field. We all had a try on handling the rope and speculated afterwards by our camp fire on the reason of our failure to find any game. Johan is also having a try with the bell-rope. It could be that the day had been unusually hot and that the hares prefer to stay in their hiding places protected from the heat. The field could have been a bad choice for a place to hunt. We have been here many times but only seen tracks of animals here, no actual creatures moving about so we know not their habits of movement around it. Or it could be that we wasn’t as quiet and careful as we should have – after all we are not as skilled as the medieval hunters would have been. 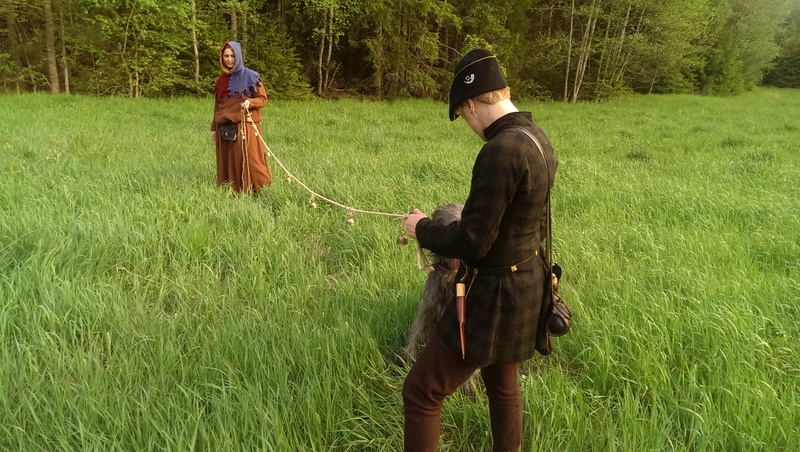 To hear the song of the bell rope for yourself, take a look at the short film Johan made about our attempt to reenact this medieval hunting technique.